December 8, 2011. The dissident Vietnamese priest Nguyen Van Ly (age sixty-four) is deported from a rest home in the Archdiocese Hue to the concentration camp Nam Ha in the north of the country. Van Ly, who is half paralyzed after having suffered four strokes, still faces five years in prison for his peaceable struggle against the totalitarian communist regime--a peaceable struggle he has waged for nearly forty years.We follow Father Ly, a nurse, and his guards through the twenty-four hour ordeal of getting from Hue to Nam Ha via ambulance. Arranged according to the liturgy of the hours, each chapter offers a glimpse into the life of Father Ly. This hagiographic journey, here placed in its context of Advent, offers hope for captive and oppressor. And it is hope especially that makes Father Ly realize his life's struggle for religious freedom is not in vain. Indeed, as a goodwill gesture before President Obama's visit to Vietnam, Father Ly will later be released on May 20, 2016. ""All Men Become Brothers is as contemplative as it is compelling. May it remind us that there's a liturgy to our survival and holiness to our resistance."" --Michael T. McRay, Educator; Storyteller; Author of Where the River Bends""Herein is the story of a faithful, resilient witness to the Kingdom of God, contesting a self-righteous empire. To be sure, the principality conspires to break Father Nguyen Van Ly's fidelity, and its ferocity physically scars the long-imprisoned priest. Unbroken, Father Ly transforms what was intended for retribution and reprisal into a narrative of hope and redemption. If the Acts of the Apostles were written in contemporary Vietnam, it would surely read like Koenraad De Wolf's account."" --Richard C. Goode, Lipscomb University; Editor, And the Criminals With Him: Essays in Honor of Will D. Campbell and All the ReconciledKoenraad De Wolf is a Belgian historian and publicist who specializes in the history of Vietnam. He has written historical fiction since 2014. For more information, visit www.koenraaddewolf.be. 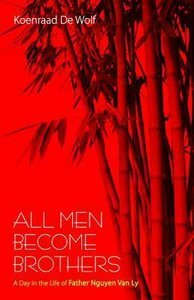 About "All Men Become Brothers"
Koenraad De Wolf is the author of many books and articleson various facets of history and art history. For this book hepersonally interviewed Alexander Ogorodnikov several timesand extensively researched numerous sources, includingsecret documents from the KGB archives in Moscow. Helives and works in Belgium. Visit his website at www.koenraaddew, olf.be.